Tim Hortons to launch in China: Is it the right move? The president of Tim Hortons is aiming to bring the “best of Canada” to the world’s second-largest economy with its plan to expand the coffee and doughnut chain into China. “This is the perfect moment, I believe, for us to go into China. We’ve matured in our understanding of the Tim Hortons brand as a management company,” Alex Macedo told BNN Bloomberg in an interview Wednesday. Tim Hortons said it will partner with Cartesian Capital Group in a joint venture that aims to open 1,500 Tim Hortons restaurants in China over the next decade. Macedo added the aim is to bring Canadian friendliness and hospitality to customers in China, but noted there will be a lot of localization when it comes to food menu items. “What we’re going to write on our walls and getting into the restaurant is basically, ‘welcome to Canada, welcome to Tims,’” he said. Macedo added franchises won’t be family-operated like many are in Canada, at least not initially. 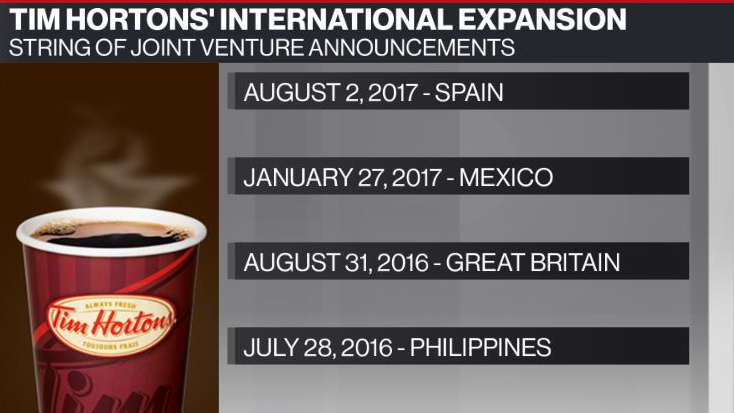 Tim Hortons has more than 4,700 restaurants around the world, and entered four new markets last year: Spain, the Philippines, the U.K., and Mexico. In 2012, Cartesian Capital partnered with Tim Hortons parent company Restaurant Brands International and the Kurdoglu family to develop the Burger King brand in China. There are now more an 900 Burger King restaurants in China. "We are excited to expand our partnership with Restaurant Brands International to bring Tim Hortons to China," Cartesian managing partner Peter Yu said in a statement. "Tim Hortons has a long, rich history of providing guests with quality food and premium coffee. We plan to expand that tradition to China, drawing on 20 years of experience building businesses in China and around the world." In addition to Tim Hortons and Burger King, Restaurant Brands owns the Popeyes brand.